Today, I am going to discuss something that I feel is very important – I am going to be educating you about Pokémon. I know most people believe it is a children’s franchise, and while that is partially true, it concerns me that so many fail to see the whole picture. To call Pokémon a child’s game and to look down upon those who enjoy it, you must understand what the franchise consists of entirely; otherwise you are simply proving your own ignorance. Pokémon originated from a video game and was created by Satoshi Tajiri in 1996. The main story of the franchise is that you start off as a young trainer to receive your first Pokémon at the age of 10, with your goals being to battle so your creatures grow stronger while also catching all the different varieties of Pokémon in the world. The idea itself is not particularly childish, given that each Pokémon you catch is meant to obey your every command from then on. Ash Ketchum’s Charizard clearly demonstrates the perils of owning a Pokémon which does not respect the trainer. Many Pokémon types actually seem quite dangerous for children to handle, such as Fire and Electric. Although the anime makes this comical, being electrocuted before an explosion is really not what a child should think is fun. The franchise heavily involves elements of collecting and battling, both of which can be interpreted in various ways. Collecting can be more of a children’s activity, but this depends on the subject matter of what is being collected. Collecting monsters which are raised to fight is certainly not something just aimed at children. What is the reason behind collecting Pokémon? Is it because the anime makes you laugh, or because you wanted to catch them all, or because you built a good team when you played the game, or because you enjoyed the franchise so much in your youth that you want to own as much of it as you can? Do you appreciate the art and imagination behind it? Or perhaps for all of these reasons? Battling is by no means a children’s activity, as you will see. The mechanics of the game can be quite complicated, as demonstrated by the catch rate formula in addition to IV and EV values. Competitive battling itself is quite serious and many players are adults, as can be seen at places such as Smogon. Even since the old R/B/Y generation games, Pokémon training has been affected by Individual Values (IVs) and Effort Values (EVs). 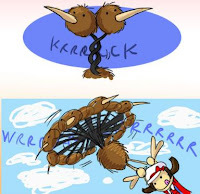 IVs refer to the ‘genetics’ of each individual Pokémon. This means that every Pidgey you catch has different pre-determined stats. Those with high IVs have the maximum potential to reach level 100 with the highest stats possible for that Pokémon species. But, those ‘born’ with low IVs will never reach stats as high as those with high IVs, no matter how many vitamins you give or how well you train it. This system means that in order to raise the most powerful Pokémon, you must screen each and every creature you catch and calculate their stats very carefully. Pokémon found to have low IVs need to be replaced so that any time spent in training will go to a worthy candidate. Successive breeding increases the chances of obtaining a naturally talented Pokémon, as IVs are hereditary to some degree. In later generation games, Pokémon natures were also significant and could be somewhat controlled by breeding. The maximum IV amount in any one stat for the more recent Pokémon games is 31. The chance of catching a wild Pokémon with a perfect 31 in all stats is reported to be 1 in 887,503,681. Breeding increases these chances, though they are still terribly low. EVs are points gained when battling a certain type of Pokémon as an opponent. For example, when your Pokémon battles with a Raichu it gains 3 EVs in Speed. Every 4 EVs you gain for a certain stat is equivalent to one extra stat point at level 100. 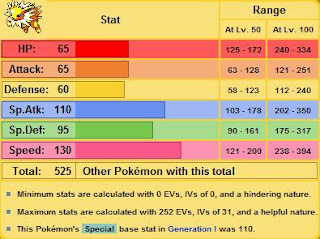 This means that if your Pokémon battles four Raichus, it will gain 4x(3 EVs) = 12 EVs, which translates to 3 extra stat points in Speed at level 100. 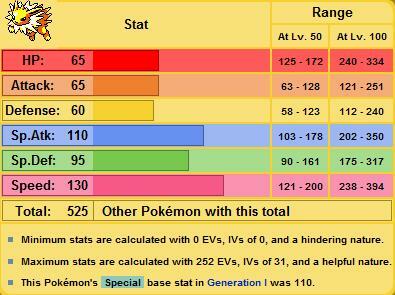 There is an EV cap of 255 for each stat, and a maximum total EV cap of 510 per Pokémon. Since every 4 EVs equates to an ultimate stat gain of one, to train a Pokémon to maximum potential you must consider the base stats and the purpose or role you need it to play before you begin. The number of EVs you choose to put into a certain stat should be divisible by 4, and since 255 is the stat cap, a maximised stat should have 252 EVs put on it. So looking at Jolteon, whose highest base stats are 130 in Speed and 110 in Special Attack, I would assign 252 EVs in Speed and 252 EVs into Special Attack. The remaining 6 EVs would usually be dumped into HP. From the base stats, Jolteon is meant to be a fast special attacker and so should be trained for that purpose. Since speed is both valued in a sweeper and is Jolteon’s greatest stat, I would be seeking to raise a Timid natured Jolteon with 31 IVs in both Speed and Special Attack. IVs and EVs are hidden in-game, so in order to calculate what they are you will need an online stat calculator and perhaps some Rare Candy. To accumulate the EV points needed, you will have to find an area where you can fight the desired Pokémon which gives the specific stat points you need repeatedly. Noting down how many of each kind of Pokémon you have fought accurately is essential for a correct EV distribution. EVs can also be increased partially with vitamins, which you can use to raise a stat up to 100 points, but no more. There are also items such as the Macho Brace which double the amount of EVs gained from an opponent during battle in exchange for a temporary stat cut. You will notice higher stat number increases after level up during EV training, such as +6 or +13. Different coloured forms of Pokémon also exist, which are known as ‘shiny’. 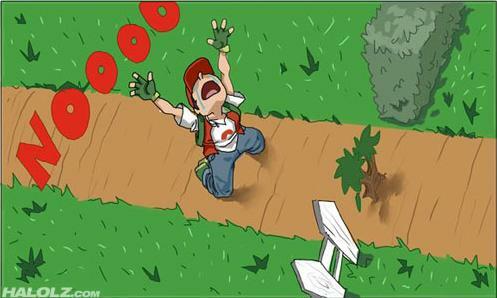 The chances of meeting a shiny Pokémon during battle are 1 in 8,192. As you can imagine, coming across a shiny Pokémon with both perfect IVs and the right nature is virtually impossible. There are several ways around these hurdles. 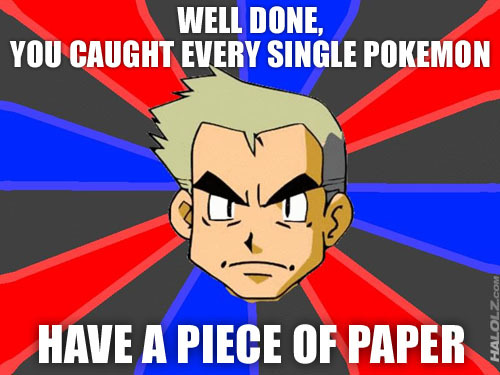 The easiest method to perfect your Pokémon is to use a flashcard with the Pokesav program. This allows you to open all your Pokémon’s details up and mess with them to your heart’s content. More legitimate ways to gain a shiny Pokémon you want include RNG abuse, soft resetting and using the Pokeradar. While breeding will probably not result in a Pokémon with 31 IVs in each stat, with luck it can provide a Pokémon with three stats maxed out in IVs and quite high IVs in the remaining stats. Given all these complications, obtaining a successful competitive team is largely a process of weeding out the unworthy, before deciding on and then calculating a good stat distribution to train for. Why are 10 year old children thrown out of their homes to fend for themselves, and then given creatures of mass destruction for battling? 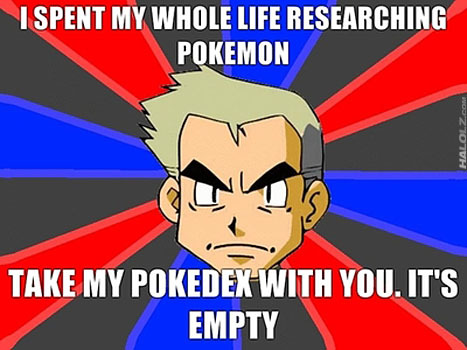 Why do researchers rely on children to fill the Pokedex? What does the entire world of Pokémon look like, and exactly where are all the regions located relative to each other? Why don’t Pokémon die in battle? How does the Pokémon Centre restore health in a matter of seconds just using a PC? Why can you jump over hedges, but are unable to move past a small shrub unless you have the Cut HM? How come Pokémon don’t know how to Fly or Surf naturally? Why do Pokémon take CDs to learn new moves? Why don’t we ever see either people or Pokémon eat each other? 10. What do the bodies of Diglett and Dugtrio actually look like? 11. Do trainers actually defeat each other to steal the loser’s money? 12. Does an Onix egg weigh 200kg? 13. Why is a Ditto enough to produce so many other Eggs? 14. Why doesn’t Team Rocket steal deposited Pokémon from PCs? 15. Why don’t all Pokémon just run off and destroy everything, like Gyarados? 17. Why would Missingno cause godly item duplication? 18. Why did Red spend three years standing top on of a mountain? 19. How come people don’t use Psychic Pokémon to brainwash and rule the world? 20. How can Pidgey, Spearow, Doduo and Dodrio Fly you around the world? 21. Why don’t people just sell Master Balls since they know how to make them? Why does Ash suddenly swing from being an idiot to being clever during competitions or gym battles? Where is Ash’s father, and what has he been doing all these years? 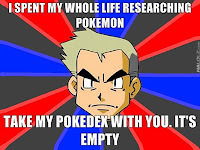 Why is Professor Oak constantly hanging around Ash’s mother and not his own family? Where is the rest of Gary’s family anyway? 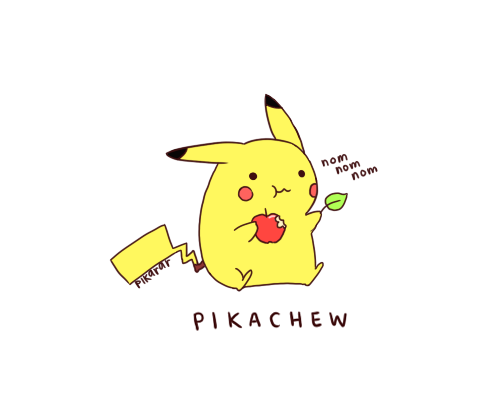 Why hasn’t Ash been permanently disfigured by Pikachu’s electricity? 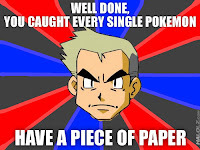 What is actually wrong with Brock, and is it related to why he left Professor Ivy at the Valencia Islands? Why isn’t Meowth famous for speaking human speech? 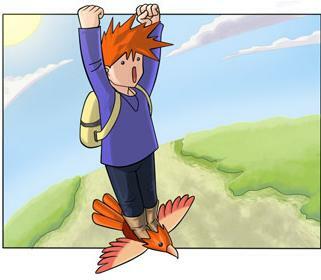 What is Ash’s Pidgeot thinking now, having been forgotten and abandoned by him in Viridian forest? Why does James seem to enjoy dressing up as a woman so much? Where do Ash and friends get most of their money from? 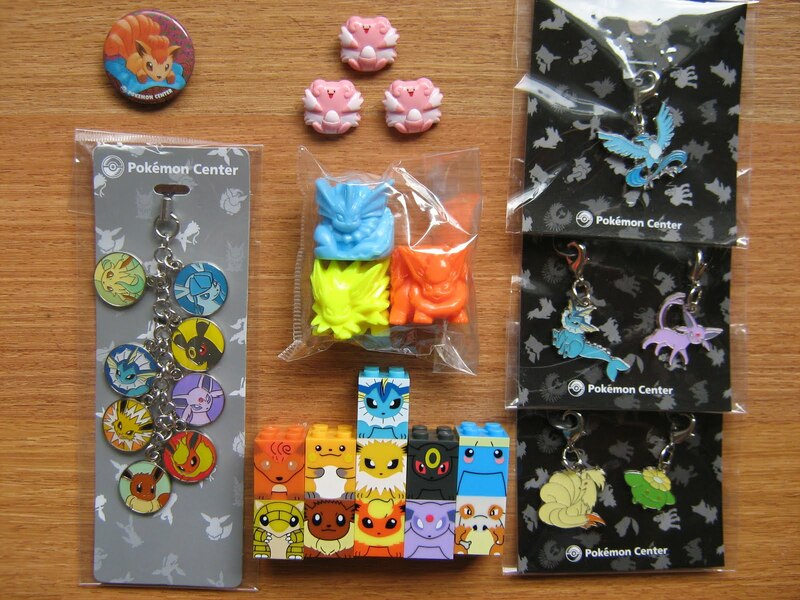 Moving onto the merchandise itself, the range of Pokémon items made for the purpose of collecting is immense. 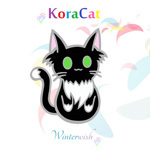 There is a massive selection of different figures, cards, stickers, games and plush in addition to lesser known items such as charms, dice and books. The two types of figures I consider the most worthwhile for solid collections are Kids and zukan. Kids are vinyl, almost chibi-style figures which have a wide variety of poses for each Pokémon species. The material they are made of has a somewhat soft and rubbery feel, and makes them quite durable. 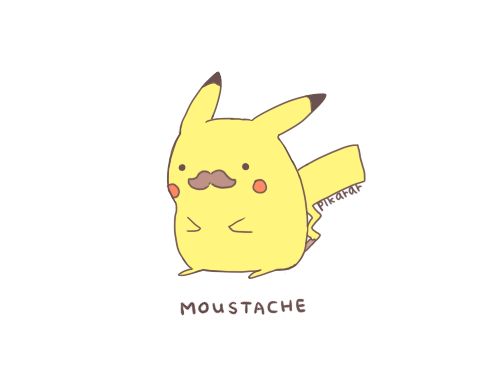 There are hundreds of these to be found and often several different Kid versions for each Pokémon. Kids are good at showing how Pokémon look while attacking or in other new ways. In addition, they are generally produced in large quantities at a time and are quite cheap. 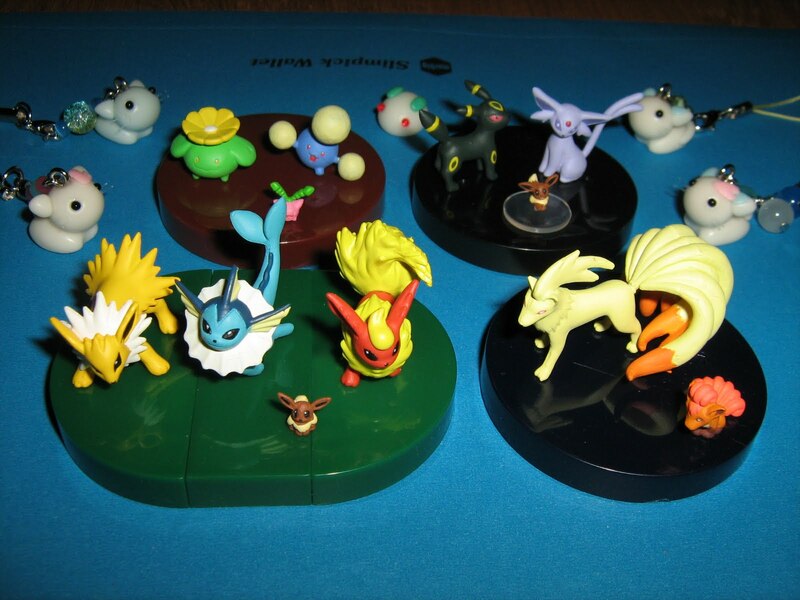 Zukan are more realistic style figures, produced to be at a 1/40 scale to the actual listed size of the Pokémon. These can be rarer, and some of the older pieces can go for very high prices. There is usually just one set for each species of Pokémon, but there are a few exceptions. Zukan give a good idea of Pokémon size relative to other Pokémon, which brings a new dimension of realism to a collection. Apart from these two types of figures, there are many others. Full Color Stadium figures and Tomy figures are also quite popular, but I personally feel they are not as well made as Kids or zukan. There is also a good amount of different flat items to choose from. 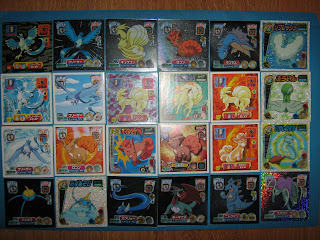 Apart from the popular Trading Card Game, there are also Japanese VS. Cards and other cards which follow the anime show. 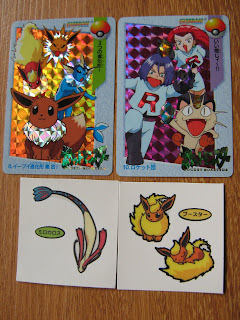 At present, I am interested mostly in older Japanese cards such as VS. Cards and the Sugimori Cardass set. Both of these types of cards are dedicated to Pokémon attack art, which I think is a good part of the franchise to have for display. The two more popular varieties of stickers available are known as Amada stickers and Pan stickers. 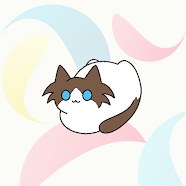 Amada stickers are generally cheaper and have the most variety of different art. They are coloured solidly and some are printed with a shiny hologram or glitter effect. 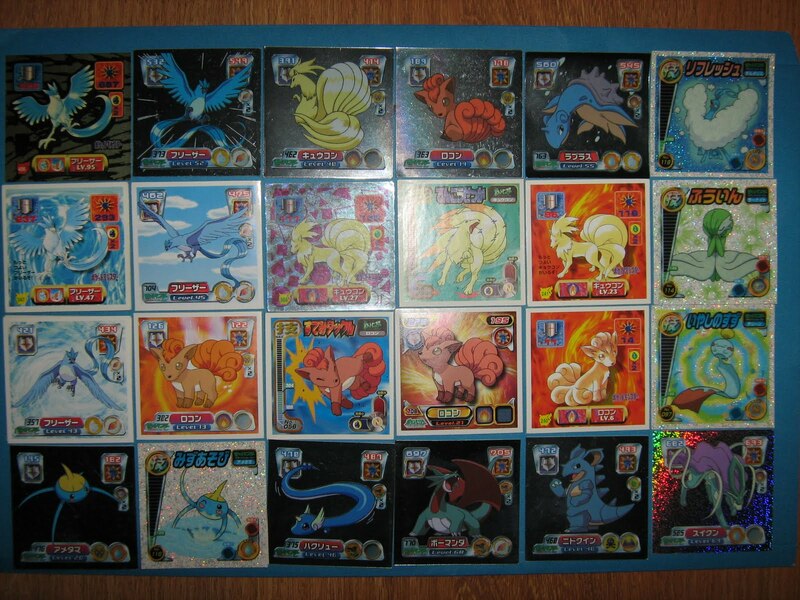 Pan stickers are usually more expensive and the Pokémon are printed on a durable, transparent background which allows for reuse. Since Amada stickers have such variety in their artwork and because of their shiny print, I collect them almost exclusively over Pan stickers. 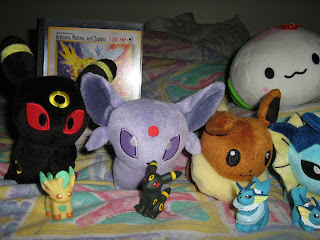 Plush are a very popular item for collections. 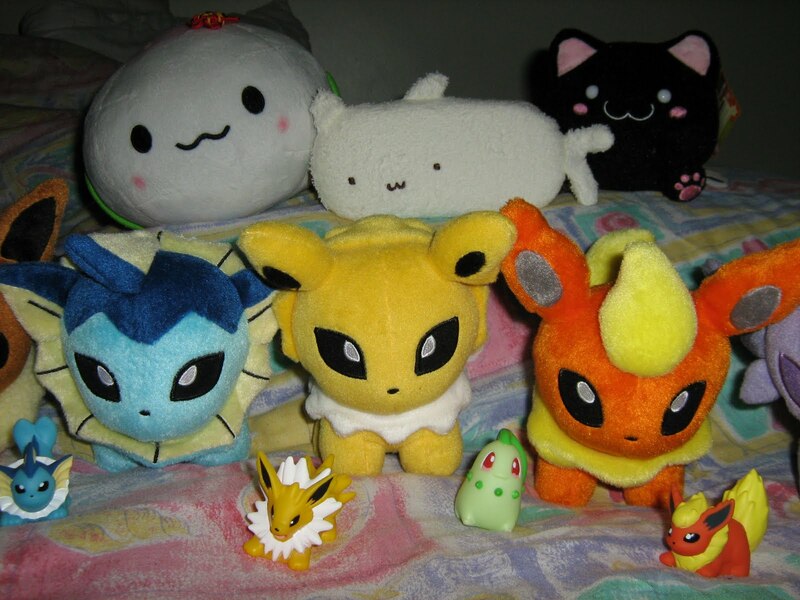 There are quite a few different kinds of Pokémon plush, but I believe Pokedolls are the way to go. Pokedolls and similar style plush are very carefully made in a chibi-style. The number of different Pokémon made in this style is unfortunately small, however. The Pokedoll plush series of the first five Eevee evolutions are the best collection plush you will ever see. A few other interesting plush types include Canvas plush, UFO Catchers, Bell plush and Friend plush. Some other more miscellaneous groups of items are also a good addition to a collection. 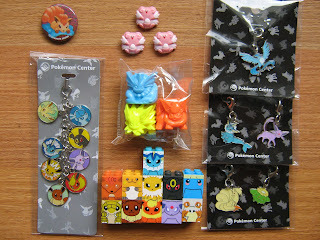 There are many very well made Pokémon charms available. There are two types of charms which I would say are the best. 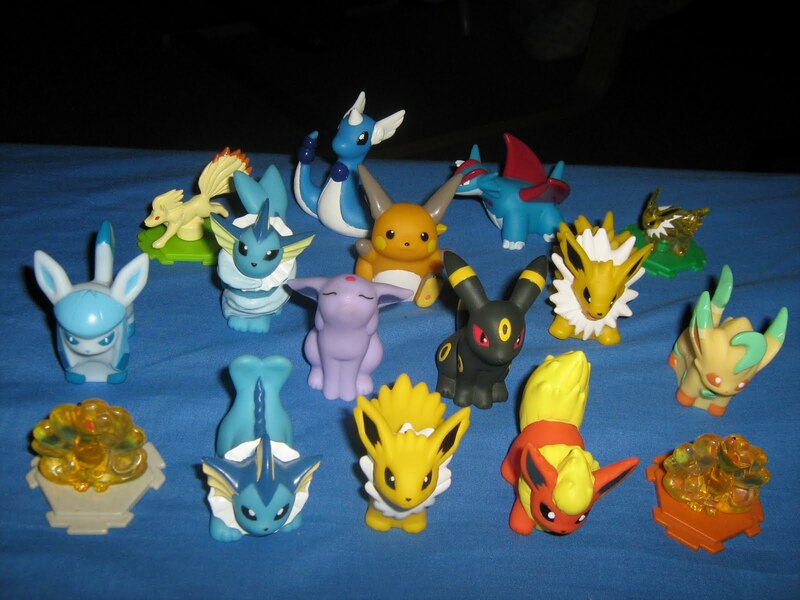 One would be Pokedoll charms, and the other are the more recently released Johto Dex Charms. Pokedoll charms are drawn in the same chibi style as the plush, and so they are a great accessory. Johto Dex charms were released in Japan as a promotion for the Soul Silver and Heart Gold games, but are harder to find now. They feature all of the first 251 Pokémon with new art. Pokémon dice are an older and lesser known item. 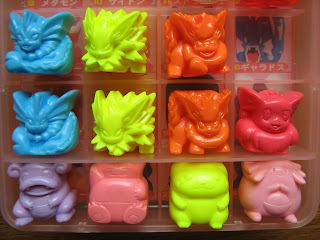 They are coloured, plastic Pokémon loosely compacted into a square shape. Each Pokémon dice may come in different colours, sizes or poses. Many of these dice appear to be hard to find now, particularly if you are looking to collect all the different poses of a particular Pokémon that was made. These dice came unpainted in their boxes, so it was expected for the buyer to make the effort to paint them as shown on the display picture. As well as card and sticker art, there were many Pokémon art books released. Apart from game guides, Pokedex, encyclopaedia volumes, attack guides and comics can also be found. New anime style art is seen in some encyclopaedia books while there is softer art shown in attack guides. There are also a number of children’s books with unique illustrations, especially in the ‘Where’s That Pokemon?’ books, which is a similar series to the ‘Where’s Wally?’ books. I hope this has been an enlightening experience for those of you who were not previously aware of these facets of the Pokémon franchise and those who enjoy it. It serves as a small reminder that we cannot make judgements about the characteristics of a person just by glancing at what they enjoy without understanding the aspects behind it fully. It does not matter if something seems to be childish or stupid on the surface, whether it be Pokémon or not, we should either respect what makes the person in question happy or gain a deep enough perception before we attempt to dispute it. *I take absolutely no credit/responsibility for any hilarity experienced from images or videos you may encounter on this page. 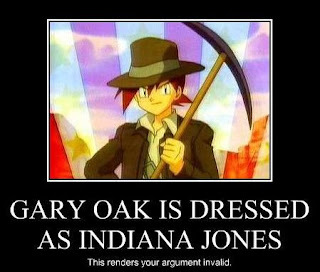 :> Most are courtesy of Google searching, etc.